What Does Baking Soda Do for Orange Marmalade? Jams and table spreads can be made from almost any fruit or berry, provided you find the correct balance of sugar and acidity to help the mixture gel. One of the most interesting variations on this theme is marmalade, made from the juice, fruit and most notably the peels of citrus fruits such as oranges. Many recipes for homemade marmalade include a modest quantity of baking soda in the syrup. Although you can leave it out, it has several beneficial effects. The earliest ancestor of modern marmalade was made with quinces, a rock-hard fruit closely related to apples and pears. They're naturally high in pectin and acidity, and when simmered in honey they formed a thick, spreadable gel called melimelon, the root of our modern word marmalade. In later centuries, quinces were replaced with citrus fruits, most notably the bitter oranges of Seville, which grew more abundantly and gave the spread a bright, sunny flavor. The fruit itself contributed flavor and acidity, while the peel contained the pectin and an additional dose of concentrated orange flavor. Pectin is found naturally in almost all plant foods, though in varying concentrations. It's one of several carbohydrates, called hemicelluloses, that glue plant cells together and give them strength and structure. Ordinarily, pectin and its kin form tight, strong bonds. When cooked, those bonds become loosened, which causes the fruits or vegetables to soften. Under certain conditions, the pectins can be coaxed into forming new, looser bonds that immobilize your fruit juice into a tender gel, the kind that otherwise would require meat-based gelatin. Baking soda helps create these conditions in orange marmalade. Cooking up a batch of marmalade is a multistep process, which includes peeling and chopping the fruit, trimming the bitter, spongy white pith from the peels, and simmering the peels to tenderize them. Baking soda is usually added at that latter stage in the process, in a tiny quantity. Baking soda is mildly alkaline, and it helps to break down the chemical bonds in pectin and its related hemicelluloses. When it's added to the pot, it shortens the time needed to soften your orange peels and free the pectin from its original bonds. 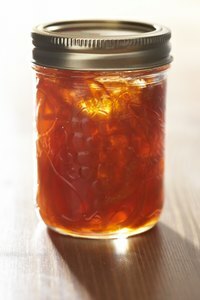 Aside from large quantities of pectin -- either naturally occurring, or added separately -- marmalade and other jams require lots of sugar and acidity. Typically, novices run into trouble by using too little of one or the other. Sweet fruits often require a splash of lemon juice to bring the jam's pH to the range pectin prefers, roughly 2.8 to 3.5. Most orange juice falls right into that range, but if you're using tart oranges -- or Seville oranges, which are acidic and slightly bitter -- your marmalade might be too acidic for the best gelling reaction. A pinch or two of soda can correct that, bringing you back into the optimum range. Why Does Citrus Fruit Split Open Before It's Ripe?